Went to the in-laws in early November. The German had a meeting in Düsseldorf on Wednesday, so we drove in on Tuesday night and the girls stayed with Oma and Opa on Wednesday while I drove to the city with him. While he did his (all day) training, I wandered around the city a bit, trying to figure out where we might want to live, or at least crossing off some areas. 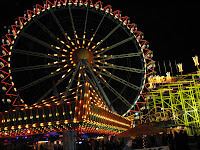 It was a good week to go because we wanted to visit die Kirmes, which was having its 670th holding in Soest. It is the largest in city carnival/fair in Europe and perhaps in the world. The really neat thing about it is that it is built directly inside the city and Soest is a cute walled city. Looks very different with a carnival built inside it! The fair starts every day at 4ish and runs through later than we stayed up (we went home 1 am). On some of the rides it looks as if one’s feet will brush church steeples! We rode this ferris wheel and it was great, although raining. Luckily, the rain stopped and the weather moderated and the evening wound up being very nice. Chrissie (our former au pair ) lives in Soest, so she had come back from school for Kirmes and we met up and wound up going about until after midnight, where we had thought that we would leave shortly after 8:30, when the fireworks ended. But we had a great time being shown about and tasting things and looking at things and drinking (although the German couldn’t partake, as designated driver). When we got back to the house, we found that K, my niece, who was staying over as well, had been ill.
Saturday morning I also was sick as the proverbial dog. I spent the morning uebergeben for the first time in 24 years and I didn’t enjoy it. I also didn’t enjoy my in-laws belief that my illness was due to over indulgence (that belief disappeared after Opa came down ill that evening). Chrissie was also sick as a pup the next evening so clearly a very nasty virus was making its way through Koerbecke. I threw up more times than I care to mention. Both kids are sick again (November 17th) with what I had last week probably, so I think I will need to call a babysitter for Monday.